June 7 – July 4. Both Bill and Liza grew up with artist’s in their families. Bill recalls time spent with his grandfather, William Bertkau. One of the intriguing stories he told was the time he painted a life size locomotive for the 1939 World’s Fair. Liza recalls time spent with her artist mother, Janet E. Smith. “We would travel the beautiful country roads of the tri-state area together looking for a road or barn that inspired us.” Liza also recalls that the connection to constructing a “great” abstract like she does comes from watching her Dad fixing something from repurposed parts. 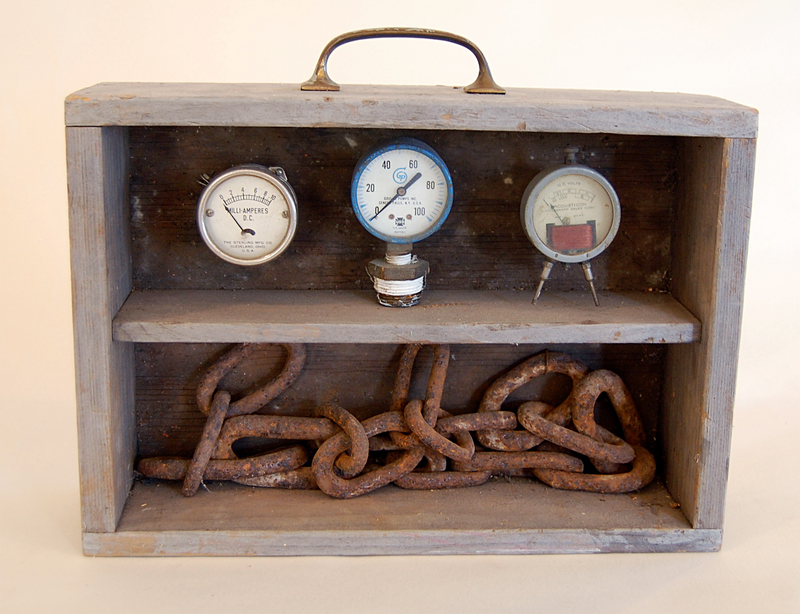 The mystery of Bill Rabsey’s work continues with the “Lost and Found” series, in which old objects find new life and meaning as art pieces. In his studio he uses a collection of unusual objects as his medium to create thought provoking and clever sculptures. He doesn’t limit any objects from being used in his work. Subtle Earth tones, textures and random shapes supplied by rusting metal, colorful copper and brass, wood objects, antique toys and tools become the palette from which he works to create his sculpture and wall pieces. 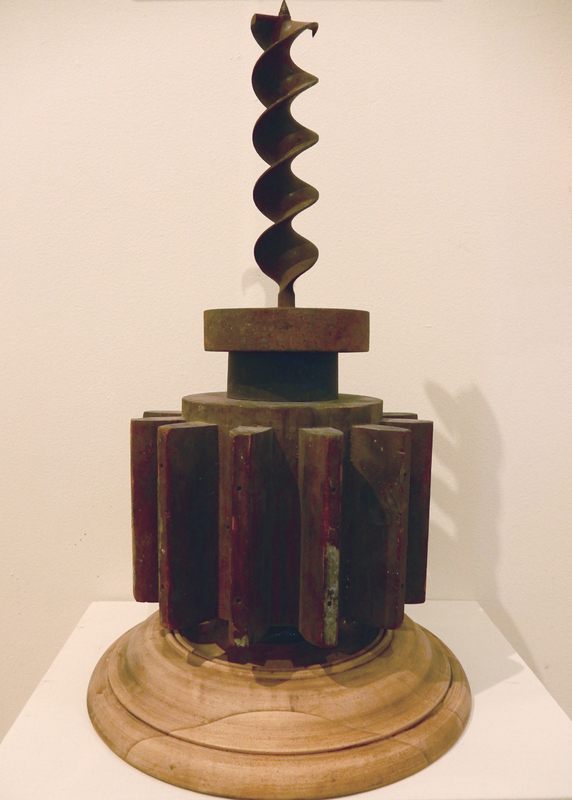 He attaches the sculptures to exotic bases of Mahogany, Teak and Rosewood. Many of the objects he finds are found along the shores of the Hudson River where past industries once stood. He also has found interesting objects from his travels and visits to antique stores. He received his B.S. in social studies from SUNY New Paltz and a M.S. from Teachers College Columbia University. It was at Columbia where he became a supervisor, overseeing the graduate students who were employed in the media lab doing photography, film and television production. Then he was employed by the Middletown School District in the Media Center. Since retiring he has been able to focus his attention on creating art from his vast collection of objects. Her saying has been “Every Path Leads to a Journey.” Her journey has nurtured diversity in her work. Just as America is diverse, her journey has nurtured diversity in her work, which is reflected with a variety of mediums, substrates and styles she uses interchangeably. She derives most of her subject matter from nature, finding the country roads, rivers, lakes and even NY City scenes of great inspiration. If she isn’t sitting outside painting and sketching she will use her camera as a record of the view that has inspired her. It’s not just about putting on canvas what she loves. It is also about capturing the viewer’s interest by using a compositional formula and providing focal points. This is seen in her painting “The Calm Before the Storm”, in an area where her Dad worked in Sparta Township. This acrylic painting shows the movement of the clouds and how calm the water is before the storm. The white light and reflection in the water tells you there is a storm approaching. Her natural curiosity to discover what’s going on behind the scenes has lead her to develop her successful abstract series. 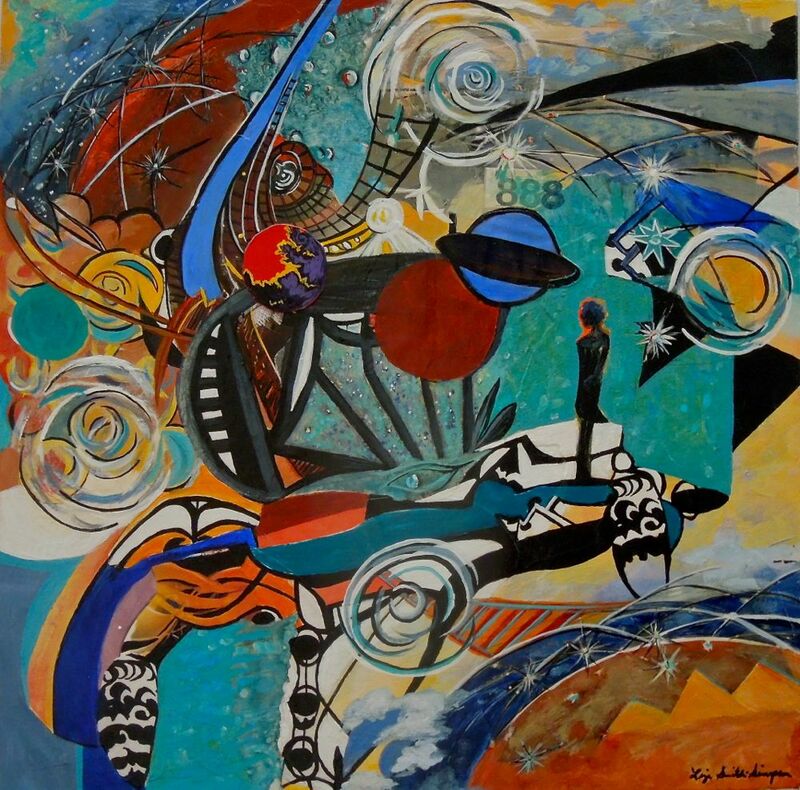 “Flight Paths”, “The Future is a Portal” and “Coming in for a Landing” are constructed using rich color palettes and handmade collage pieces. Liza received a Bachelor of Art with a major in Psychology from Caldwell University. Her paintings have been purchased for private collections in the U.S. and Canada. She has also taken many place awards. May 10 – June 4. Throughout the ages, artists have turned to nature for their inspiration. 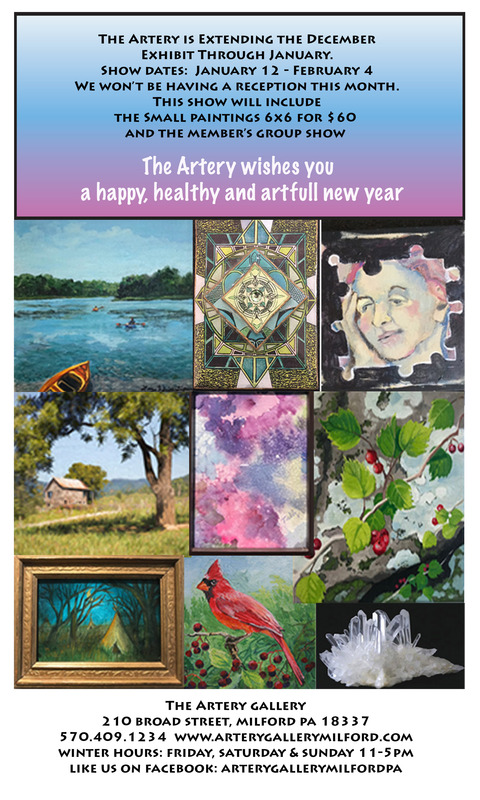 This May, for the second year, the Milford Garden Club will collaborate with the Artery Gallery for a month-long exhibition that turns this traditional approach to making art on its head. Displayed side-by-side with artwork by Gallery members will be masterful horticultural interpretations created by Garden Club members. In a sense, the artwork becomes the source of inspiration for nature. In relation to the artwork, using flowers, branches, found pieces, and a varied assortment of horticultural invention, the Garden Club members turn their interpretations of the art pieces into works of art in themselves. 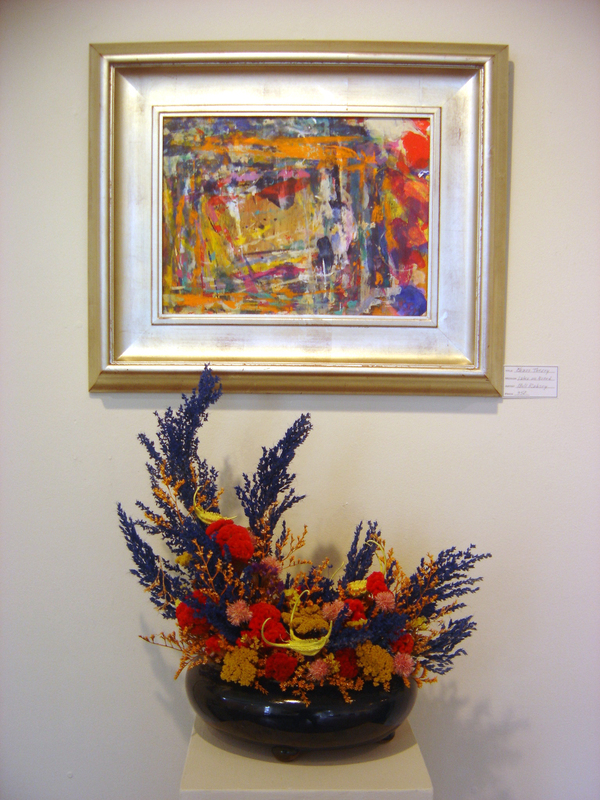 Examples from last year’s Exhibition include Bill Rabsey’s abstract painting “Chaos Theory.” It’s floral companion using home made dried flowers in similar reds, burnt oranges, and yellows. The sweeping placement of vertical purple branches reflecting the brushstroke action in the painting. 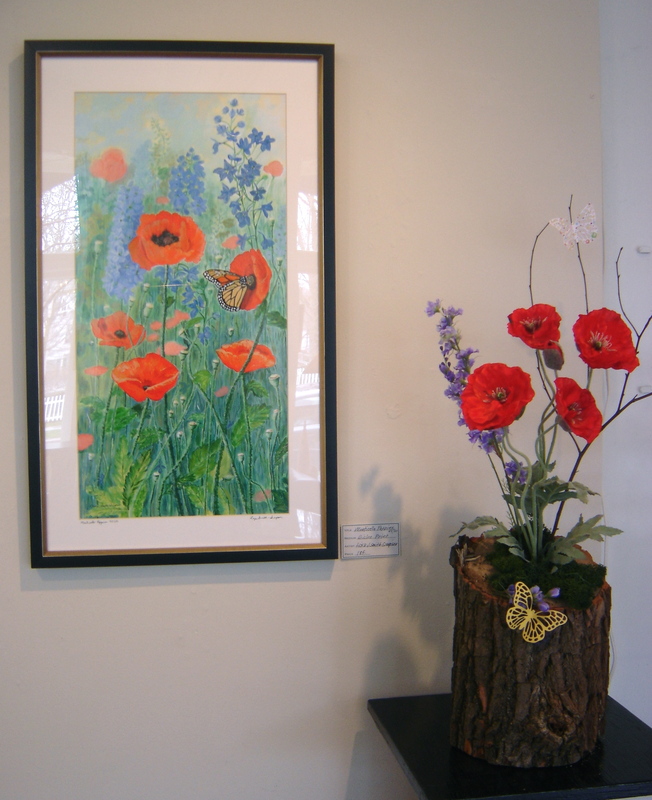 Liza Simpson’s “Monticello Poppies” was interpreted using sticks, red poppies, purple-blue verticals and butterflies, mirroring the painting image. Once again, this year the Gallery will be filled with these beautiful and imaginative floral displays based on a colorful and rich exhibit of the Gallery members’ own art. The Milford Garden Club has been beautifying and serving Milford through its energetic volunteer membership of 81 years. Its programs are many and include its annual flower show, its beautification program throughout the Borough and three public gardens, its community garden where food is grown for the Ecumenical Food Pantry, and a scholarship program. The Club has a unique role in the preservation of the Milford Rose, its history and tradition. 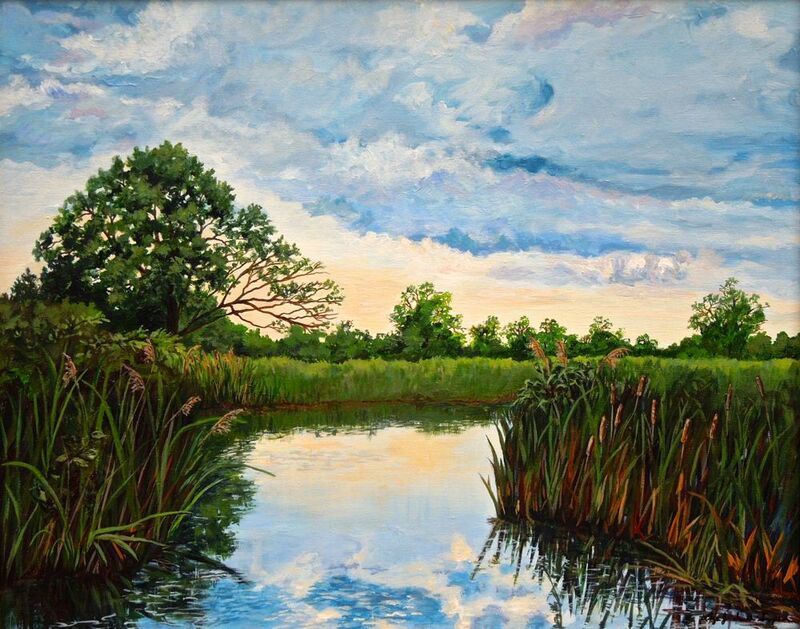 The ARTery Gallery is excited to announce it will host the Delaware Highlands Conservancy from April 19 – May 7. 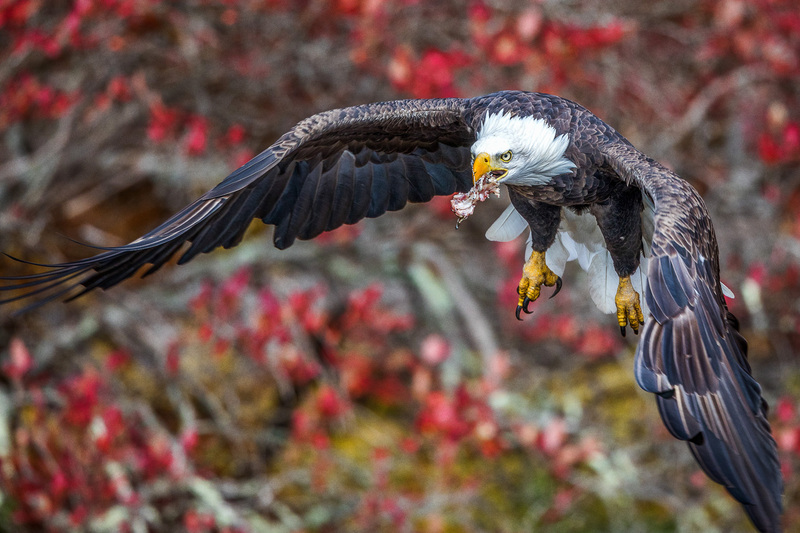 This first ever joint Exhibition will feature photographs of eagles generated by the Conservancy and bird themed artwork created by ARTery member artists. 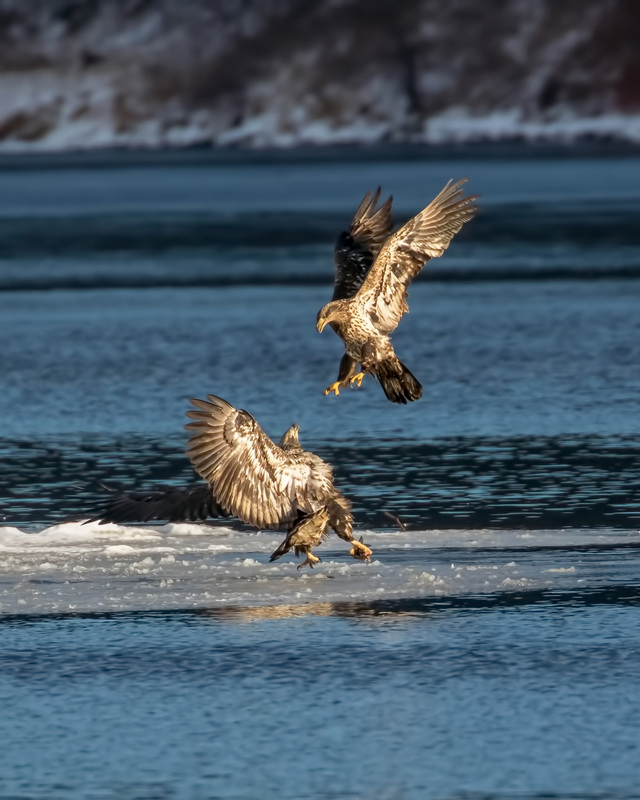 In February, the Conservancy held it’s first annual photography contest: “Sharing Place: Eagles and Their Environs.” The contest invited photographers to capture striking eagle inspired photos of the Upper Delaware River region focusing on these raptors, their habitat, and factors important to eagle welfare. The 15 Winners will be exhibited at the gallery. The April Exhibition will be a bird lover’s delight. In addition to the Conservancy photos, the co-operative gallery artists will display their own interpretations of raptors, song birds, and various other avian species that capture their imagination. These include paintings, photos, prints and birds or habitat in other media. A reception, open to the public, will be held Saturday, April 21, from 5 – 8 pm to unveil the winners of the contest. Conservancy staff will be on hand to talk about their eagle programming and land protection work; as will the photographers who participated. The Delaware Highlands Conservancy works with landowners and communities to protect the natural heritage and quality of life of the Upper Delaware River region. To learn more, visit their website at DelawareHighlands.org.